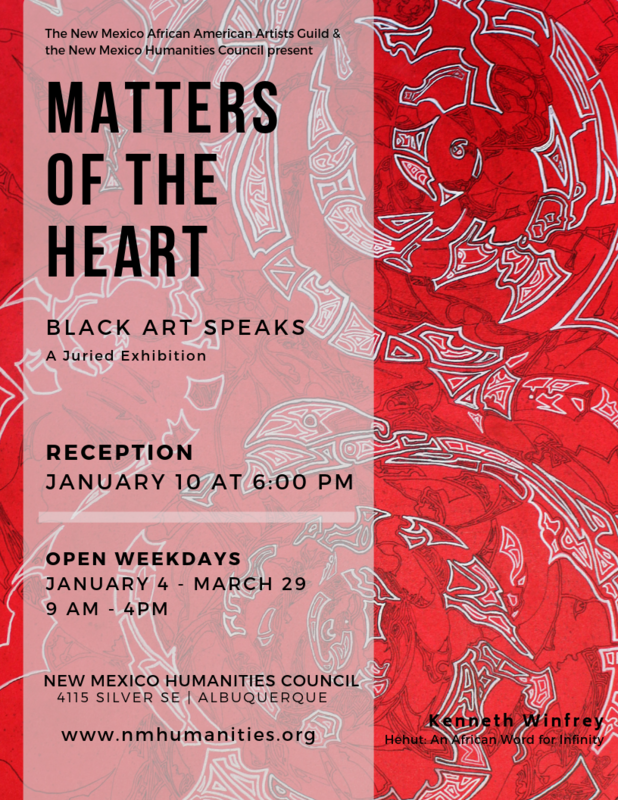 Join us on Thursday, January 10, 2019, 6:00 – 8:00 pm at the New Mexico Humanities Council Gallery for the opening reception of Matters of the Heart: Black Art Speaks, a juried art exhibition curated by the New Mexico African American Arts Guild. Featured artists will discuss their work and inspiration. In this collaborative exhibition, artists of Black African descent display a wide range of expressions and impressions from life on the African continent, through market slavery in the world, to contemporary manifestations of beauty. It features several award-winning artists, including Kenneth Winfrey, Edna McIver, Karen Jones Meadows, and Doris Fields. Many pieces in the show transform the audience from viewer to participant, as they solicit emotions. For example, at a distance what looks like a tree of life is actually a tree of death with the faces of African Americans slain by law enforcement officers and the image of a slave ship at the roots, in Karen Jones Meadow’s collage, Amerdica 1619-2017. The complexity and creativity of human experiences and celebration of culture in the images encourage exploration and understanding of the uniqueness of people throughout the African Diaspora; this is particularly evident in Kenneth Winfrey’s Initiation of Man. The artists get right to the heart of the matter, a mixture of beauty, struggle, survival, transformation, and ultimate emergence as artistic agency. As “heart,” the works are nothing less than intimate, deeply felt, humanist, and ever-evolving. Each visitor can expect to be touched within their own hearts and feel the connection and recognition of the oneness of all people. Featured artists include Patricia Baron, Bouchra Belghali, Michael Carson, Doris Fields, Annie Gillespie, Lemonary, Karen Jones Meadows, Edna A. McIver, Sean Moon, Davis Muwumba, Gwen Samuels, and Kenneth Winfrey. Matters of the Heart: Black Art Speaks will be on exhibit January 4 – March 29, 2019 at the New Mexico Humanities Council located at 4115 Silver SE, Albuquerque. Gallery visiting hours are Monday through Friday, 9:00 am – 4:00 pm.